- Guide Book - This reunion planning keepsake guide and spreadsheet workbook package is ideal for making notations, following a step by step guide, writing a journal and printing assignment worksheets for distribution at event planning committee meetings. Spreadsheet Workbook - Step through the planning process using the family reunion planning spreadsheet workbook. 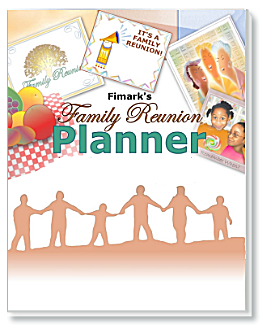 Includes Fimark's Family Reunion Planner guidebook in PDF, a timeline planner, attendee roster, budget planner and committee list contact database. "We Aspire to Inspire You." To help you plan, organize and manage a memorable family reunion start with this list. 1. 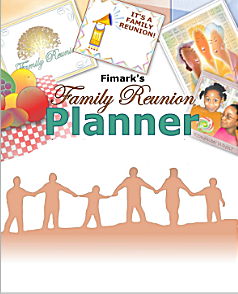 Download Fimark's Family Reunion Planner eBook and Event Planning Spreadsheet and start planning the most memorable reunion ever. 2. Prefer to use an online web app? Access Fimark's Family Reunion Planning web app here. 3. Print the reunion planning worksheets provided for individual planners, groups and planning committees. 4. Follow the step by step timeline planner and checklists found in the book or web app. 5. Watch the reunion planning video to get inspiring event planning ideas. Includes reunion planning ebook and speadsheet roster. with Excel compatible spreadsheet invitee roster. Keepsake event planning package includes guidebook with printable committee worksheets and excel spreadsheet organizer - $29. Includes five themed reunion planners and associated Itineraries, activity ideas, checklists, genealogy research presentation forms and more. Download the complete family reunion planning guide ebook with signature page, recipe compiler, and journal keepsakes features. Use the spreadsheet workbook to organize and manage event details. Prefer the paperback hardcopy of Fimark's Family Reunion Planner Keepsake Guidebook? Order them here. Over 1850 Likes and Counting! Fimark Home Online is a media publisher of event planning apps, books and and family entertaining guides. Fimark Home Online web pages do not endorse any commercial providers or their products. Privacy: Personal identifiable information including name and email submitted via contact us forms will not be shared with a third party for any reason what-so-ever. The information contained herein is provided as a public service with the understanding that Fimark Home Online makes no warranties, either expressed or implied, concerning the accuracy, completeness, reliability, or suitability of the information. Nor does Fimark Home Online warrant that the use of this information is free of any claims of copyright infringement. Copyrights � 2005 - 2017 by Fimark Home Online, 914 Belgian Ave Suite 1B Baltimore, MD USA, all rights reserved. All materials appearing on the Fimark Web Server (WWW.FIMARK.NET) may not be reproduced or stored in a retrieval system without prior written permission of the publisher and in no case for profit. We've directly helped over 3000 families plan their reunions over the past decade. We are determined to continue bringing families together to empower and inspire them to build strong supportive bonds. Fimark Home Online is the director of the Family Reunion Planning Group. This group spearheaded the campaign to promote November as Annual Family Reunion Planning Month with literary contributions to Wikipedia, 5 event planning guides, and the ever popular reunion planning web app. Fimark empowers families with it's weekly business blog and online business plan archive of over 50 tried and proven business plans as well as the Introvert's Guide - How To Start A Successful business in print and digital format. Fimark's Family Reunion Planner Guide and Keepsake with thousands of copies distributed. The monthly Family Reunion Planning blog and newsletter reaches over 900 members. We've created 100's of printable event annoucement templates and provide event planning videos featuring fall fests, outdoor activities, storybooks, original background music, and inspiring reunion planning ideas. Because of our success aspiring to inspire you, you can make it your firm and determined resolve to donate to our cause.